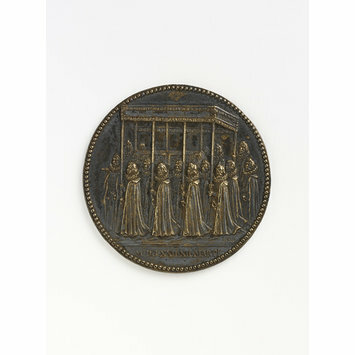 This medal depicts the funeral of Albert, Archduke of Austria (1559-1621), Governor of the Low countries and is made by Anton (or Adriaen) Waterloos, in Brussels, signed and dated 1622. Waterloos (1600-1684) was a Flemish medallist and seal-engraver. He was made a Councillor in 1661 and appointed Mint-master general in 1663. The object came to the museum through the Salting bequest. George Salting (b. 1836; d. 1909) - an Australian, who settled in England - was a prolific collector in a number of areas, including Chinese and Japanese ceramics and European art. By 1874 his collection had outgrown his residence in St. James's Street, prompting him to lend items to the South Kensington Museum. After his death in 1909, the majority of this astonishing collection passed to the V&A, where it was shown in its own galleries. 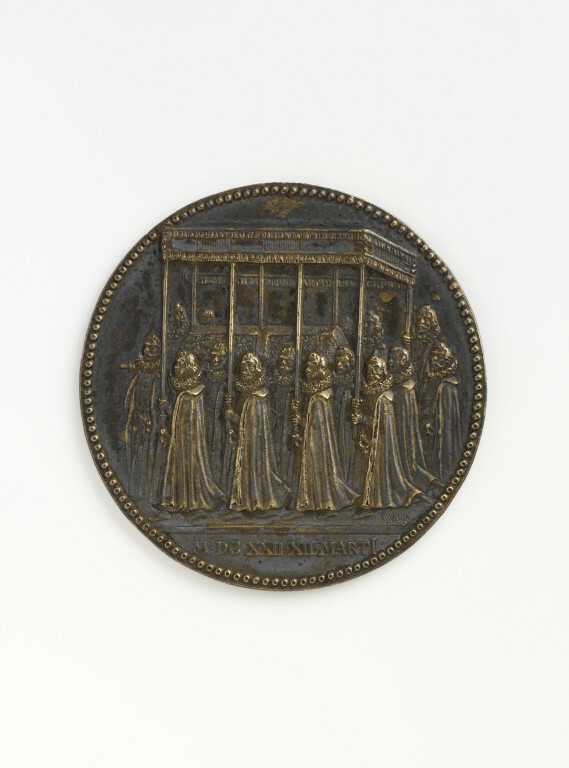 Obverse: the funeral cortège, moving to the left, consisting of the coffin borne by eight men, beneath a canopy, borne by eight others, with two more following. Inscription. Reverse: a right arm proceeding from the clouds, holding a sword twined with olives. Inscription. Another similar version of this was sold at Sotheby's London, Coins and medals sale, July 5, 1994, Lot n. 187 (£2,420).